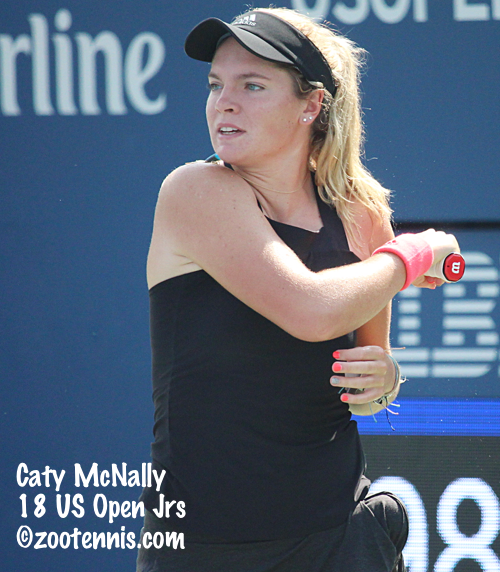 Caty McNally has had impressive results on the Pro Circuit since claiming the US Open girls doubles title in September, winning the doubles title at the $80K in Macon Georgia, reaching the singles quarterfinals at the $80K in Tyler Texas last week, and with her victory today, advancing to the semifinals of the $25,000 USTA Women's Pro Circuit tournament in Lawrence Kansas. McNally, who turns 17 later this month, earned her first WTA Top 200 win last week in Tyler with a first round win over Veronica Cepede Royg of Paraguay. Today she defeated WTA No. 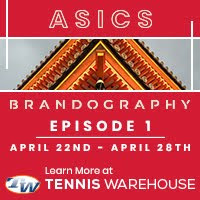 178 and top seed Bianca Andreescu of Canada, 6-1, 6-2 to claim her second Top 200 win, and as a qualifier, McNally has already posted six victories this week. She will face former Clemson Tiger Romy Koelzer of Germany, a 27-year-old ranked 467, in the semifinals. Koelzer defeated qualifier Emma Navarro 7-5, 6-2 in today's quarterfinals. The other semifinal features lucky loser Catherine Harrison(UCLA) against current UCLA star Ena Shibahara. Harrison came back from 6-1, 4-1 down to beat 16-year-old qualifier Katie Volynets 1-6, 6-4, 6-4. Shibahara, who is taking the fall off to play Pro Circuit events, is also a qualifier. She defeated Connie Hsu(Penn) of Taiwan 6-4, 6-2. The top seed at the $75,000 ATP Challenger in Knoxville also was eliminated today, with 2013 Ohio State NCAA singles champion Blaz Rola of Slovenia beating former Tennessee star Tennys Sandgren 6-4, 6-4. Only three seeds have advanced to Friday's quarterfinals: No. 4 seed Michael Mmoh, No. 8 seed Reilly Opelka and No. 5 seed Tim Smyczek. Mmoh and Opelka will renew their lengthy rivalry in the quarterfinals, with Opelka having won 5 and lost 3 of those meetings, winning the last three, all at the Challenger level. (Mmoh has a win over Opelka at Kalamazoo that is not in the records above). Smyczek will also face another American, Bjorn Fratangelo, while the fifth American in the quarterfinals, former Georgia Tech standout Chris Eubanks, will play Evgeny Karlovskiy of Russia. Eubanks defeated No. 7 seed and Charlottesville Challenger finalist Peter Polansky of Canada 6-3, 6-4 in 49 minutes, hitting 21 aces. Opelka had 23 aces in his 7-6(10), 7-6(6) win over qualifier Michael Redlicki(Arkansas). Danielle Lao(USC) and No. 8 seed Nicole Gibbs(Stanford) will meet in the quarterfinals of the $80,000 USTA Women's Pro Circuit event in Las Vegas after Lao beat No. 2 seed Heather Watson of Great Britain 5-7, 6-1, 6-1 and Gibbs defeated Grace Min 6-2, 7-5. Wild card Louisa Chirico can join them in the quarterfinals if she wins her night match against Kurumi Nara of Japan. At the $15,000 Futures in Niceville Florida, four Americans have reached the quarterfinals: No. 6 seed Trevor Johnson(TCU), No. 2 seed Strong Kirchheimer(Northwestern), No. 8 seed and Georgia recruit Trent Bryde and No. 4 seed Justin Butsch(LSU). The second round of singles is complete at the Oracle ITA National Fall Championships, with the top three seeds in both the men's and women's draws recording wins today. Women's top seed Fernanda Contreras of Vanderbilt needed three sets, but got by Ida Jarlskog of Florida 6-1, 0-6, 6-4. No. 2 seed Estela Perez-Somarriba of Miami and No. 3 seed Evgeniya Levashova of Pepperdine both won in straight sets. After three women's seeds lost yesterday, two more were beaten today, with Duke's Kelly Chen, the No. 5 seed, falling to Christina Rosca of Vanderbilt 4-6, 6-3, 6-4 and No. 16 seed Lisa Marie Rioux of Oklahoma State losing to Meghan Kelley of Virginia 6-1, 2-6, 6-4. As with the women, the men's top seed was also taken to a third set today. Wake Forest's Petros Chrysochos defeated Andy Andrade of Florida 6-2, 5-7, 6-3. For the second day in a row, No. 3 seed Paul Jubb of South Carolina recovered from dropping the first set, with the score of his win over Gonzalo Morell Raschiatore of Middle Tennessee State 4-6, 6-1, 6-2. No. 2 seed Christian Sigsgaard of Texas beat Mitch Harper of Virginia Tech 7-5, 6-2. Seven of the top eight men's seeds remain after the second round, but only No. 10 seed John McNally of Ohio State is still alive among those ranked 9-16. No. 11 seed Jan Zielinski of Georgia lost to Kyle Seelig of Ohio State 6-1, 6-3; No. 12 seed Laurens Verboven of USC lost to Johannes Schretter of Baylor 6-4, 6-1; and No. 15 seed Aleks Kovacevic of Illinois lost to Luis Erlenbusch of Tulane 6-2, 7-6(5). The second round of women's doubles is still in progress, but after two rounds of men's doubles, only one seeded team remains: Mississippi State's Giovanni Oradini and Niclas Braun, the No. 5 seeds. 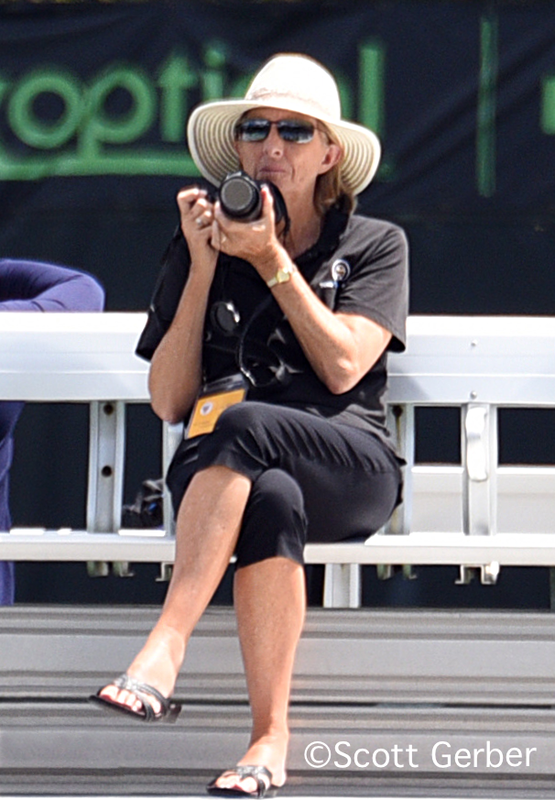 Live scoring can be found here, and two courts are streamed here.